I know. I get it. It’s torture to have to watch President Trump deliver a speech…any speech. And the State of the Union is even worse because it includes so much phony pomp and ceremony, presenting the President as more of a King than of the intended administrative executive of the government. Watching members of Congress fawn over him like teenage girls do for the lead singer of the latest boy band is most definitely cringe worthy, at the very least. It’s not just Trump…this spectacle has been absurd for all Presidents for as long as they have been televised…and they get worse every year. Yes, Trump will tell numerous lies and greatly exaggerated claims about all of his great accomplishments during his first 2 years in office. He will ironically and shamelessly call for unity and bipartisanship. He will once again state his case for his wall on the Mexican border. He will claim how much he has restored respect for America from all other nations around the world. He will do all of that, and even more nauseating nonsense. So, why should we subject ourselves to it? Because it’s important that somebody does. I believe that way too many people don’t bother to watch these things, whether they claim to or not. Too many people didn’t actually watch the debates in the Primary or even in the General Elections. Instead, they relied on others to tell them what happened…to fill them in on only what they need to know, according to those others. On the right, of course, most Republicans rely on Rush, or Hannity, or Levin, or FoxNews in general to inform them of how the speech went. It often amazes me to see the initial, raw thoughts about such speeches and then watch as the sentiments shift according to how the pundits and partisans spin it, and the polls reflect the new opinions from a lot of people that didn’t actually even watch it. Yes, the same thing happens on the left. 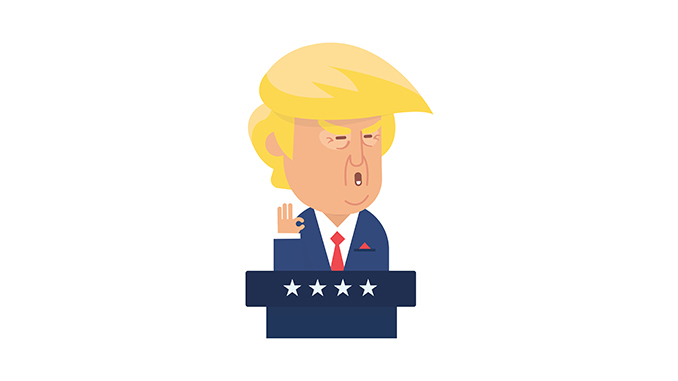 If you are a Trump supporter, you will look for reasons to say it was a great speech and when all of the Trump sycophants explain why it was so great, you will be more than happy to join in with the praise. And if you are anti-Trump, you are likely to do the opposite. And that’s the problem. We have way too many people who are not truly thinking for themselves. They are allowing the partisans to do it for them. Just like the best way to learn about the Constitution and the founding principles is to do so by studying the actual source documents rather than allowing others to interpret them for you, the best way to evaluate any speech, debate, or interview is to actually watch it for yourself and base your thoughts on your actual, firsthand experience. It’s fine to then listen to and consider other analysis of the speech, but you’d be doing so with full understanding. You would be less likely to be swayed by partisan bias and talking points when you can actually see when the whole story is not being told, or when you can recognize when certain parts are being relayed to you completely out of context. And that’s important because it is a great way to see who those pundits are that are attempting to fool you and we can gain a much better understanding of who to trust for their intellectual honesty and who to completely dismiss, ignore, and shun. Self-government is hard. Sometimes, it’s harder than usual, as in the case of having to suffer through a completely delusional narcissist as he blusters and bloviates his way through a speech where so much of it is obviously insincere and so much else is obviously untrue. Because if we are to attempt to discuss and debate these things with others with any lasting effectiveness, it’s important that we be the more informed ones. It’s the same reason why we should pay attention to all of his insane tweeting. The more we are informed about all of these things, the better we can present our arguments and dispatch those incomplete arguments of those who obviously did not actually watch it. The biggest difference between those of us conservatives who remained anti-Trump and those who reluctantly voted for him is the amount of information we were working with in drawing our final conclusions. I 100% believe that. The more speeches, rallies, interviews, and debates that you actually watched in full with Trump, the less likely you were to ever vote for him for anything. But those who merely watched highlights of those speeches, rallies, interviews and debates, with short clips based on what their preferred sources/pundits wanted them to take from it, were more likely to support him. So we should watch the SOTU, even if it pains us to do so. But we don’t have to suffer it alone. Join us here at TNB for the live feed and concurrent discussion. We’ll get through it together, while adding a bit of humor and snark.